In total hip replacement surgery (also called total hip arthroplasty), the affected hip joint is removed and replaced with a metallic implant. Total hip replacement surgery is usually performed in people who have severe arthritic changes. Normally they have a lot of pain in their hip and find difficulty walking or walk with a limp. Its an extensive surgical procedure that involves slitting open the muscles around the hip and buttock. Muscles that are usually cut are those that are required for walking and using the stairs. These are some of the functional activities that can be affected with hip arthritis. You don’t have to wait until your hip surgery to come and see a Registered Physiotherapist Mississauga. In fact, seeing a Registered Physiotherapist right after your decision to undergo a replacement surgery can get you back on your feet quicker after your surgery. You can set up a pre surgical appointment with PhysioNow to get you ready for your surgery. One appointment before the surgery can save you recovery time after the surgery. We can go over all of the things you need to know for after the surgery. – Physiotherapists at PhysioNow Mississauga will closely work with you to get you back on your feet early after surgery. Check out this video if you want to see a bit more of what to expect with Total Hip replacement surgery. It is from the University of California, but it gives a comprehensive overview of the procedure and explains it quite well. Registered Physiotherapy Mississauga will help with functional recovery after your total hip replacement surgery. Total recovery from Total Hip replacement surgery takes an average of three months. The surgeon should send you home with a list of instructions to follow immediately after surgery. It is very important to follow the precautions that the surgeon gives you to avoid serious complications. Your physiotherapist can review these precautions with you! 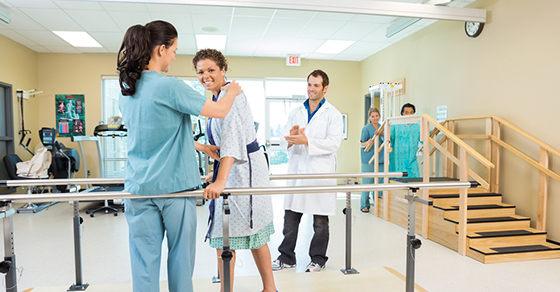 After Total Hip replacement surgery, you will be ready to see a physiotherapist for further treatment outside of the hospital within 5- 7 days after discharge from the hospital. You should expect to see your physiotherapist 1-2 times per week depending on your progress for up to 3 months after surgery. Good Luck with your Surgery! Please call us to get started on recovery or to prepare you for your surgery! Call today! 289-724-0448. Very nice subjective article…i love it….